Kyrie Irving nearly brought the Cleveland Cavaliers back against the West-best Portland Trail Blazers by himself. Unfortunately for him, Damian Lillard answered by adding to his rapidly growing late-game resume. With 7.1 seconds on the clock and the Cavs and Blazers tied at 116-116, Lillard took the inbounds pass from Nicolas Batum, faced off against the defending Alonzo Gee, and pulled up from 30 feet. He buried it, notching his second game-winner in as many games after Sunday's overtime winner against the Detroit Pistons. Irving got one last chance to send the game to overtime, but his three-pointer hit the back iron as time expired to seal Portland's 119-116 road win. Lillard finished Tuesday's game with a remarkable 36 points, eight three-pointers, 10 assists, and eight rebounds, becoming the first player to reach those totals since then-rookie Jason Kidd in April 1995. 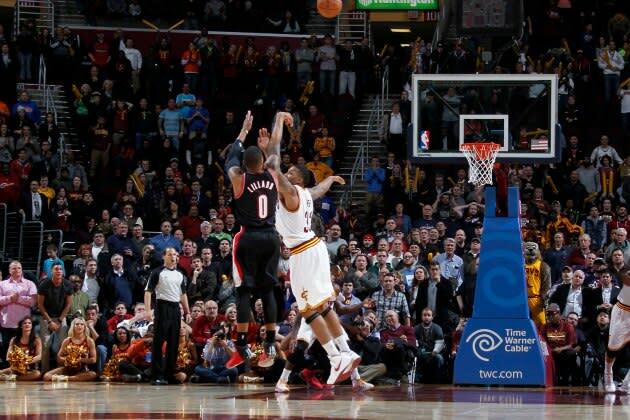 However, Lillard's late-game heroics were almost outdone by those of Irving. With the Cavs down 114-108 with 1:34 remaining, Irving scored nine points in 61 seconds to bring his team within two points. After a LaMarcus Aldridge miss with 17 seconds on the clock, every person at Quicken Loans Arena knew that Irving would get the ball. So, naturally, he took Batum off the dribble, drew three defenders, and dumped off a perfect blind pass to Anderson Varejao for an easy game-tying lay-up. Lillard, however, ensured that he would be the story of the game. Join us after the jump for some more information on his growing reputation as one of the NBA's best closers. The simple fact that Lillard hit game-winners in consecutive games would be enough to bring him attention, but the degree of difficulty of both shots adds to his accomplishment. While Tuesday's 30-footer is amazing in its own right, Sunday's off-balance turnaround jumper was arguably more amazing. Additionally, both winners came directly after amazing plays from opponents, indicating that Lillard has a special flair for the dramatic. As teammate Robin Lopez proved, it all deserves a firm handshake. Lillard is in only his second season, and it's possible that we're working with a small sample size. However, as the 22-4 Blazers continue to prove themselves as more than just an early-season fluke, it stands to reason that Lillard will get much more attention for his performances in late-game situations. At the very least, it's worth keeping an eye on him in crunch time. We could be looking at the NBA next great late-game player.